Petur Iliev is a Bulgarian-born dancer and choreographer whose career is deeply steeped in the rich folk dance traditions of his family. He started dancing at the age of five at the dance ensemble of his father. Later he graduated from the Bulgarian National School of Dance Art and from the Bulgarian National Institute of Choreography in Sofia, Bulgaria. 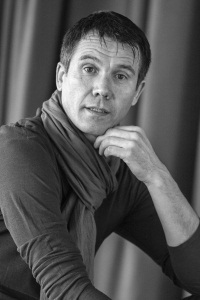 He began his professional career as a Principal Dancer of Kutev National Dance and Music Ensemble where he worked for five years, before continuing his training at the National Dance Institute in New York where he studied under the supervision of one of the gurus of American dance, Jacques d’Amboise. Subsequently, Iliev became the Artistic Co-Director of Believe in Me — a dance ensemble in Austin, TX, where for four years he trained more than a thousand young dancers. Moving to California, Iliev continued working in the American educational system teaching dance to hundreds of children in a performing arts magnet school. A year later he was appointed the Artistic Director of Westwind International Dance Company — one of the first companies in the US whose mission was to present to the American audience the richness and diversity of ethnic dance. All along Iliev has been teaching master classes in Character dance and Bulgarian folk dances at many colleges and universities in different parts of the US, and has been creating new choreographies for professional and non-professional dance companies in the US and Canada. In 2003 he joined the faculty of the renowned School of Pacific Northwest Ballet and two years later was attracted to the School of Ballet Chicago. Along with that, for several years Iliev shared his expertise with numerous students in the public school system in Chicago through a 21st Century grant. With this invaluable experience in hand he resumed his activity in Bulgaria in 2008 through the various programs of his foundation established in the same year. The Iliev Dance Art Foundation has since been running several highly successful educational programs: Spring and Summer Intensives featuring five different dance styles, a solid scholarship program for summer training in the US, and the children’s dance program Dancing Kids, targeting youth from public schools. Back in Bulgaria, Petur Iliev’s artistic creativity gradually reached its full potential resulting in the creation of highly innovative choreography. In his works, he reaches to the core of the Bulgarian ethnic dance and unlocks its structure, unleashing its potential as a contemporary means of expression by enriching it with the vocabulary of ballet and modern technique. In this endeavor Iliev has creatively collaborated with distinguished American choreographers like Christian von Howard, Theresa Ruth Howard and Paula Weber, as well as with some of the most talented and prolific contemporary European composers, who wrote music especially for his productions: Petar Ralchev, Peyo Peev, Nedyalko Nedyalkov, Svetoslav and Vladimir Karparov, Konstantin and Alexander Wladigeroff and Stoyan Yankoulov. Some highlights of choreography include: Click (2013, a full-length children’s show); 5×5+1 (2014, a conceptual, interdisciplinary project); A Swallow’s Flight (2014, another joyful children’s production); Who Stole the Chips? (2015, a colorful detective story); Outside the Frame (2015, a combination of different art forms); Where Are the Elephants? (2017, a new phantasmagorical invention for kids). In addition, Iliev has also been teaching and choreographing for the final musicals performed by the graduating classes at The Anglo-American School of Sofia.